PGHS enzymes and eicosanoid biosynthesis. (A) Urinary excretion of TXM was decreased significantly (n = 6; *P < 0.001) from values in WT mice by PGHS-1 deletion (KO) or knock down (KD), but not in PGHS-2 KO or PGHS-2Y385F mice or those treated with 100 mg/kg/d of the PGHS-2 inhibitor celecoxib for 30 days on a mixed C57BL/6 × 129/Sv genetic background. 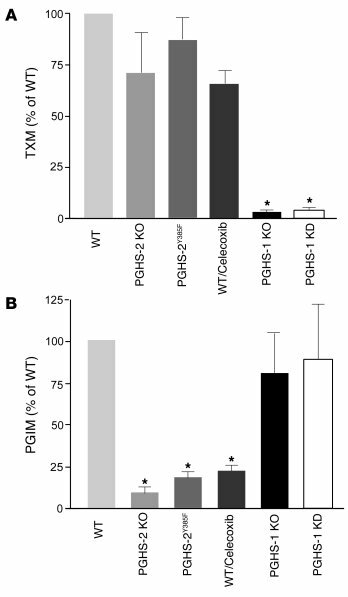 (B) Urinary PGIM was depressed significantly in PGHS-2 KO and PGHS-2Y385F mice and by celecoxib, but not in PGHS-1 KO or KD mice.